My first baby, and my first EC'd baby, Cassidy! She's about 6 months old in this picture. 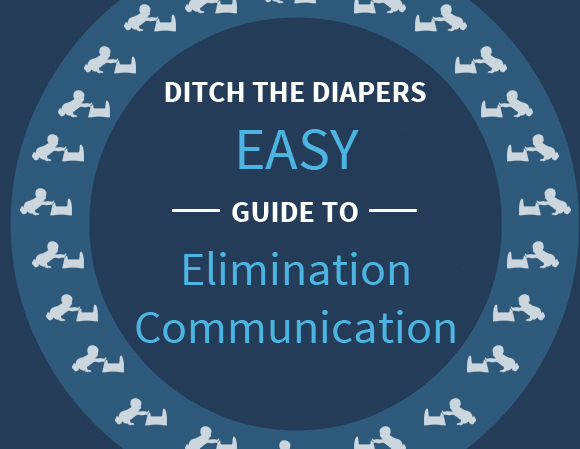 Use elimination communication (EC) to help your baby stay clean and dry. Human babies are as smart as animal babies - they know when they need to go! EC is also called infant potty training, natural infant hygiene, and diaper free. It's about listening to your baby's cues for elimination needs - with or without diapers. 6 What Do You Need to Go Diaper Free? Your baby's silky-smooth bottom - there's no way around it, any kind of diaper is hard on your baby's bottom. Being exposed to constant moisture, feces, and/or the super-absorbent gels from disposable diapers is damaging to skin. Our skin was designed to breathe and to stay relatively free from harsh chemicals or biological substances (like urine or chemicals used in diaper-manufacturing). Many babies get diaper rashes or struggle with yeast. Time without diapers on, or staying in a dry diaper, is a gift to your baby's skin! Continued awareness - contrary to popular belief, babies are not born stupid. They know when they need to eliminate. Most of us know that baby birds, puppies, and kittens quickly learn not to "soil the nest" but we doubt that human babies are able to learn the same lesson - but they can. Babies are born with an awareness of elimination and many instinctively protest "soiling the nest." Using elimination communication keeps your baby aware of these signals. Earlier potty training - it's not always true that EC'd kids will potty trainer sooner, but it often happens that way. EC'ing parents are often much less afraid of potty training, too, because you're not really worried about "pressuring your kid" or "developmental readiness." "Readiness" was invented by the diaper industry - as I already mentioned, your baby was born ready. Potty training can be simple, matter-of-fact, and totally non-coercive. Honoring your child's dignity﻿﻿ - we touched on this above when we talked about tuning into your baby and realizing that he/she is aware of elimination. When most of us think about getting older, one of the hardest things to imagine is needing help with toileting because it is a dignity issue. It's no different for our children. Honoring their ability to tell us about elimination needs, honoring their ability to "potty train" well before they ever see a Size 6 diaper, is honoring their innate dignity and desire to be in charge of their own body. "The first step to starting Infant Potty Training with your baby is observation"
If your baby isn't walking or crawling yet, this is pretty easy to do - you just arrange a little time with a bare bum 😉 This isn't a continuous thing - Andrea says (and I agree) that you want your baby to be used to having a covered bottom because that's just the way we live in our society. But when you're just getting started, bare-bum observation can help you watch for patterns, cues, and signals that your baby may give. It can be harder to observe a mobile baby because they are just so busy, but it can be worth the effort for a few hours. Camp out with baby in the kitchen, or cover the play area with towels or light blankets (thin fleece can work well). Then watch your little one run around bare-bummed. With both young babies and mobile babies you can start to add "cue sounds" in when you notice they go potty. "Shh, shh" is a common sound, or "pss, pss." Some families use a different sound (like a grunt) for a poop - we have always used the same sound. With mobile babies I usually also like to say "time to go pee" or "time for a poop" because I want them to learn the word. Other families use sign language for pee and poop - you use what works for you. I would also set up a small potty in the room with an older baby - if he or she starts to go, *calmly lift him/her (mid-pee/poop) and transport to the potty. This immediately starts to form the association that we go in the potty. I first discovered infant potty training when I found Laurie Boucke's book Infant Potty Training at my local library when my first baby, Cassidy, was 6 months old. That was all I needed to try it for myself. I didn't keep many records with Cassidy or with Asher (whom I ultimately decided not to EC and still regret that choice) - but I have kept them with Brennan, Galen, Honor, Corwin, and Sadie. These journals are good to read through as you're getting started, when you're trying to figure out signals, or when you feel discouraged! Click here to read the elimination communication journals! You can also check out this video we made of Galen when he was 5 days old! Even though I have read about Elimination Communication, and I have done a good bit of research online, I still don't seem to be starting out well trying to EC with my baby. ​So far all I've really done is make the SSSS sound when I hear him poop. It's been cold and we heat with a wood stove, so I haven't done much diaper free time to actually watch when he is peeing to see his cues. I was able to do it one day when the stove got too hot and it was over 80 degrees in the family room! But I still didn't make much of a connection. Now that you've watched your little one and read about some other experiences, it's time to start offering the potty to your little one when you notice signals - and when it's a natural time to go potty. Elimination communication has been an adventure for us with six babies - some have been really good about signals and some, well, not so much. With all of my babies, and especially the ones who didn't signal much, I used timing. Hello! My daughter is 5 weeks old. EC at night goes very well, but I often can't seem to catch things in time during the day. Have you any suggestions? There will be other times that your little one needs to go. It's also likely that your baby may develop a predictable pattern for bowel movements, and you can count on that pattern to help you "catch" poops in the potty. Paying attention to timing will really pay off. If you study baby care traditions around the world, you see infant potty training again and again. Each culture has slight variations for the practice, and many cultures have different ways to hold the baby. What Do You Need to Go Diaper Free? When it comes time to have a baby everybody gets really excited about what you need to buy - and well, I'll admit that I love baby stuff too 😉 But really, elimination communication is more about what you don't need - constant dependence on diapers. And you don't need diapers until your kids is 3 or 4! Believe it or not, with a little newborn I like to hold baby over a small mixing bowl in my lap. Being cuddled close to you makes baby feel much more secure.. The grippy bottoms on these are nice, too. The iconic little potty of the diaper free movement 😉 Once your baby is sitting on his or her own, it's nice to transition to a small potty. Some parents like to go right to the seat reducer when baby can sit (staying close by of course! ), and you might want to move to this when your tot can climb up - it makes cleanup a breeze! Typical baby clothes make EC'ing harder - cute side-snap tees look fashionable and make potty visits much easier. Pair with soft, stretchy pants, leg warmers, or split pants. Baby gowns are my absolute favorite thing to dress baby in at home from the newborn period until 3 months old or so. They make elimination communication very easy and they keep baby nice and warm! Waterproof mats are nice for observation and if you want to put baby down for a nap diaper free. I like larger sizes because they accommodate a rolling baby. They can also be useful when co-sleeping to protect against leaking milk. But you can mix elimination communication and diapers in a way that works for your family. I like how Stefanie Tellex describes it in her EC for Hackers post - it's not so much about staying dry, it's about creating an association. You're helping your baby to discover that there are times and places when we go potty. I also think that changing your baby frequently is important because you want your little one to learn that dry is "normal" - so if there's a miss change it right away. And like Stefanie also points out, you should try to potty your baby at diaper changes too - because you'll often get another pee! I talk more about going part-time in this article on part-time diaper use! But it's more worrisome when you hear doctors discourage elimination communication. The problem with listening to, say, a pediatric urologist slam elimination communication is that these doctors are literally living and breathing pathology. They only deal with kids who have problems. Taking something like elimination communication and saying that it will cause all the problems a doctor sees in his practice is a stretch. Elimination communication is not about coercing a baby or forcing him or her to hold urine or stool for too long - it's about listening to and knowing when your baby needs to go (and offering at logical times). Just as we talked about with part-time diaper use above, you may always find a wet diaper and still use elimination communication. We've used these methods with 6 of our kids and apart from a few hard stools here and there (usually as our babies were transitioning to solids making up the larger part of their nutrition), they have had very healthy, regular bowel movements. We have never had a child with a bladder infection. I know this is anecdotal, but in all honestly, it's also anecdotal to take what's happening to kids in a given medical practice and say that any baby whose family uses elimination communication is going to suffer from these problems. These kids are kids who are having issues at daycare, school, etc. They're not kids being EC'd. While I think that the advice to make sure your child pees frequently (every 2 hours) and that you should keep track of your kid's poops is good advice, I also think it's something any EC parent is probably already doing (after all, babies pee like every 20 minutes and are pooping a lot, too). Don't worry about infant potty training if it's going to stress you out - and if you feel like you're getting upset with your kid, go back to diapers and be at peace. Don't stress much about the speed of finally ditching the diapers. It will happen. But don't choose not to EC your baby just because a doctor makes dire predictions when a parent wants to step outside of the general trend of diapers through preschool. You can honor your child's dignity and keep him or her healthy while you use elimination communication. As an interesting aside, research does show that gentle elimination communication is beneficial for babies. This study demonstrated that babies with colic often find relief when a parent cradles them in an EC position because it lines up their bowels in a way that facilitates passing of gas and stooling (having a bowel movement). That's quite the opposite of the the claim that EC'ing kids causes constipation. So I’m here wondering, ‘How on earth did I not find this till now’. It’s good to see a post on EC that doesn’t conjure up scary pictures of sleepless nights and baby piss on your perfect dinner gown. I totally loved the sense of humor injected into it. Found this post while looking for references for my blog post https://fittonurture.com/?p=224&preview=true on potty training (well yeah, I used the forbidden word :)) and now I want to take down the post haha. we started this with out little girl at 6 months. She was toileting for 75% of her pee’s and 100% of her poo’s then at 10 months, she just started to refuse the toilet. she would show signs of needing to go but get really mad when we would put her on the toilet, promptly stand up and pee or poo next to the toilet. After about a month of feeling like we were fighting her on it, we have backed off putting her on the toilet. She still shows the sign for needing to toilet, and I tell her as I’m watching her go that we should be going on the toilet then promptly changing her. Do you have any thoughts or experience with this in a child? I offer her the toilet each time I see a signal but is there anything else I could be doing. I would really like to get back to her trying with the toilet. It sounds to me like you’re doing everything right. I would just keep calmly offering the toilet to her. Have her help you clean up messes that she makes beside the toilet, and keep offering at each change, and especially anytime she signals. Being still young, I wonder if her standing up is just a developmental thing – she’s practicing that motor skill. You might try having some books and special toys near the toilet and read her a (short) book to keep her sitting long enough to finish up. Or a toy she can pass from hand-to-hand for a couple of minutes and stay interested in long enough to let herself go. That has helped with a few of mine!